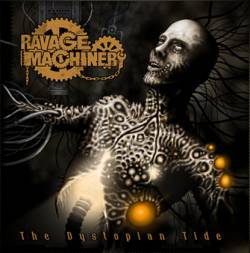 I just recently got my hands on the self-released EP „The Dystopian Tide“ from Ravage Machinery hailing from Rovaniemi in Finland. To give you a short info on the band´s history: They were founded in 2004 in aforementioned city by Raula Alaruikka, back then as a cover band called Replicators. One year later, the name was changed to Ravage Machinery, with the aim to write own stuff from then on. After their first live perfomance in 2006, the Finns have been touring in their homecountry frequently, along with bands like Rotten Sound, Profane Omen and others. Before „The Dystopian Tide“ was released, there were two demos in 2007 and 2009. While nowadays „Melodic Death Metal from Finland“ is nothing to write home about anymore, Ravage Machinery probably knowing that, put quite some effort into making their sound really heavy and aggressive to stick out of the mass a bit. As one might already guess from the title of the CD, the topics of the songs deal with a rather dark view of the future, human nature and society. „Thus I Serve“ kicks of brutally and got my attention right away. Actually the stuff that I get to hear here, has a rather Swedish Death sound to it, with grinding rythm and brutal vocals, but in the end, it´s this Death/Thrash mix that Finnish bands seem fancy a lot. The third song „Collapse To Retaliate“ has a wonderful groove and is for sure a killer song. This mix of slow DM grooves, some heavy blast parts (that sometimes seem a bit „too much“ or out of place) and the almost oldschool sound of the mix make this a convincing mix. All in all do those four songs give a good impression of what this band is capable of and their EP has quite a unique sound in a way. They do have quite some potential and if they keep on fine-tuning their material, I´m sure we can await some killer album(s) in the future. Would be great to hear some more stuff from them in the near future. Long story short: this band is for sure worth a few minutes of your time, to give them a chance and check them out!